Yoogo is a local lactic acid beverage made and sold only locally in Okinawa. Every convenience and grocery shop on the island sells it, and most of Okinawan people know and love it. Yoogo is lactic acid bacteria beverage that is made by Okinawa Morinaga Milk Industry Co., Ltd. 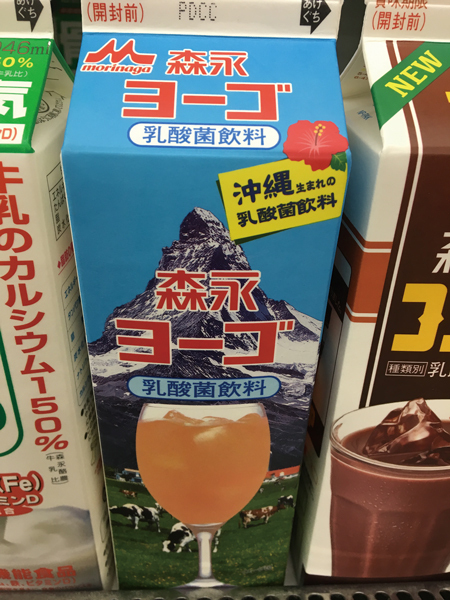 However, its package doesn’t look anything like Okinawa, because it features a snow-capped Alpine scenery and glass of Yoogo on the forefront. As the drink is not too sweet, people of every generation love to drink it. It is sold in four different size containers. A 180 cc package is the smallest and costs ¥65, a 300cc package sells for ¥88, a 472cc container is ¥108, and the largest, 946cc carton is ¥216. All prices include tax. Some people drink Yoogo straight out of the carton while others drink it through a straw.